OK, this time it is a review. 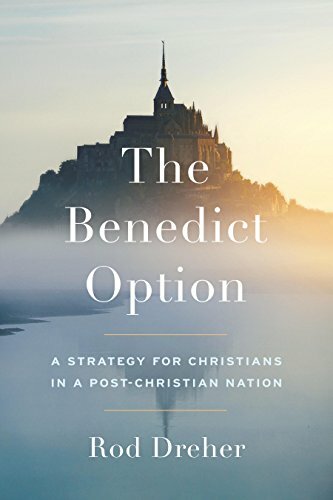 I read The Benedict Option, by Rod Dreher. I won’t lie to you–I didn’t want to. I had a pretty good idea what this book would be—a depressingly realistic appraisal of the current, radically changed situation in which orthodox Christians find themselves. Plus a series of suggestions for dealing with the new normal—all of them uncomfortable. Dreher describes how the situation of the (small “o”) orthodox church in America (and in the west as a whole) has changed, suddenly and (apparently) for the foreseeable future. Thanks to the cultural earthquake that the Gay Movement brought forth, Christians who had been ensconced, relatively comfortably, within our culture just a decade ago are now an isolated, and increasingly threatened, minority. Rod Dreher’s The Benedict Option is being released tomorrow. Collin Hansen reviews it here. My main fear with Dreher’s book is that the people who need it most won’t read it. How do you convince Americans that replacing fast food and cable news with fasting and hard labor will be good for their souls? Overwhelming evangelical support for Trump suggests not many conservative Christians would agree with Dreher that “losing political power might just be the thing that saves the church’s soul.” Rather, they seem to believe the American Empire needs our partisan politics in service of God’s kingdom. Dreher will have many interviews this week. This one with Russell Moore is bound to be one of the better ones.